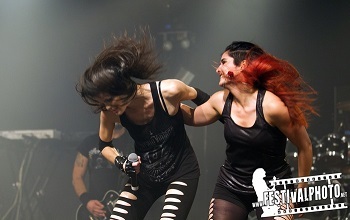 The 18th October saw the small Belgian town of Aalst once again invaded by music fans from around the world for the Metal Female Voices Fest. The Friday night is always a good start to the weekend, and this year was to be no different. After taking the shuttle bus to the nearby village of Wieze and the venue itself, the Oktoberhallen, fans had an hour to meet up with friends, grab a beer and relax before the first act took to the stage. Among the reasons I keep coming back to MFVF is the people and atmosphere, and Friday is a great chance to catch up with friends I've met at MFVF each year and who have travelled from all over the world - it really is a great atmosphere. The crew are volunteers and so we see the same people every year and every year you get to know more and more people, so the friday night reunion just gets better each year. The fact the bar in the VIP area serves around 8 different Belgian beers (all very drinkable) is just a bonus that helps the party get more fun. 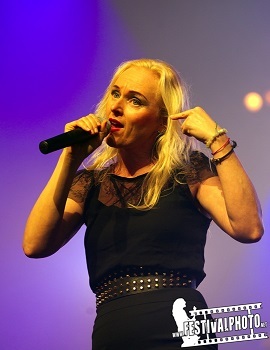 First up was Leaves Eyes singer Liv Kristine, doing her first solo show at MFVF. Her music is more pop than rock, so she was a brave choice for the organisers, but with lots of fans of Leaves Eyes there then it was clearly a popular choice. Her setlist tonight included mainly her solo material including the excellent "Skintight", but also included some Theatre of Tragedy songs (her previous band before Leaves Eyes). It was a very enjoyable set and a great start to the weekend. Next up though was tonight's main event - the Eve's Apple's. In case you're not familiar with Eve's Apple, it's not a band but is a collection of female singers who share information and contacts to promote each others bands. Tonight was to see them working with a backing band and performing a series of cover versions. With around 20 or 30 of them there (it was hard to keep track of who was there), coming on and off stage at different times, we got a series of duets with singers of often very different styles - Iliana Tsakiraki and Mary Zimmer being a perfect example, with Iliana having a very operatic style while Mary has more of a metal vocal style. Lindsey Schoolcraft, Grace Meriden, Laura Vargas and Sanna Salou did a superb version of “Rock You Like A Hurricane”, Lisa Middelhauve did a great Metallica cover, Marcella Bovio and Kassandra Novell more than did justice to ’Stargazer’ and Ailyn Gimenez, Heidi Parvianen and Zuberoa Aznárez did a fantastic version of Iron Maiden’s ’Wasted Years’. The set closed with all the singers lined up across the stage and perforing 'All we are' and ’Stars’ to finish the night off. There were so many amazing collaborations in their set that I know I've missed most of them from this review, but sometimes you've got to forget about making notes and just enjoy such a great performance. The range of talent on stage was amazing with probably half the Napalm records roster being represented for a start. After their set there was time for a quick beer before the shuttle bus took us back to Aalst for our hotels and a good night's sleep before the main part of the festival kicked off in the morning.